All Indian Institute of Medical Sciences, Bhubaneswar Autonomous Institute of national Importance is one of the new AIIMSs and apex healthcare Institute being established by the Ministry of Health & Family Welfare, Government of India under the Pradhan Mantri Swarthy Suraksha Yojana (PMSSY) with the aim of correcting regional imbalances in quality tertiary level healthcare in the country, and attaining self-sufficiency in graduate and postgraduate medical education and training. 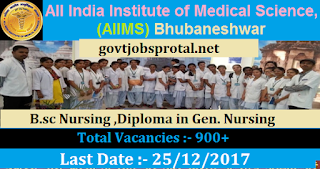 Online application are invited from Indian citizen for the following Nursing Post (Group-B) on DIRECT RECRUITMENT BASIS in All Indian Institute of Medical Sciences, Bhudaneswar(Odisha). Age :-1).Upper age limit shall be determined as on last date of submission of online applications. 2).Date of Birth as recorded in the Matriculation /Secondary Examination Certificate only will be accepted by the AIIMS, Bhubaneswar for determining the age and no subsequent request for change will be considered or granted. 3). No age relaxation would be available to sc/ST/OBC candidates applying for unreserved vacancies. 4). All the contractual employees of AIIMS, Bhubaneswar who are engaged by AIIMS, Bhubaneswar will be granted age relaxation to the extent of their period of continuous contractual engagement in AIIMS, Bhubaneswar against equivalent post or upto maximum period of five year whichever is less. However, this age relaxation will be admissible for the one time only. 2).Registered as nurses & Midwife in Sate/Indian Nursing Council. 3).Diploma in General nursing Midwifery from an Indian Nursing Council recognized Institute/ Board or Council. (Tow years experience in minimum 50 bedded Hospital. The aspiring application satisfying the eligibility criteria in all respect can submit third application only through online mode The online registration of application is made available on AIIMS, Bhubaneswar office website www.aiimsbhubaneswar.edu.in. Last date online submission of applications will be 25th December 2017. 4).Online payment details of the required Application Fee. 5). Any other details as per the advertisement. 1). No fee for SC/ST/PwD/Women Candidates of any community.